The latest Somerset Studio has arrived - March/April 2018. My column features recent experiments with paper cutting to create shadows. The first photo is a close-up I took of one piece - derived from my Rose Window stencil. I've always been intrigued by illuminated dimensional art, and while I didn't take mine that far, it was a fun self-imposed assignment to create pattern and depth with paper and just a few tools. 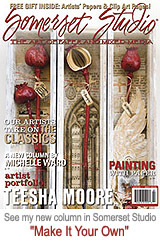 As I was turning the pages of the new issue, it was a nice surprise to land on Mary Beth Shaw's interesting article on pigments - there's a full page of my Maltese Mix stencil. Very cool. Then the Olympics! Love the figure skating....but watching snowboarding is the best!!! Shaun White taking the gold last night was so thrilling. Big congrats to him. I've been slowly working through a "frozen shoulder" with physical therapy appointments twice a week (thanks Jaime) and at-home exercises. I can tell my movement is improving but it's a long process. Makes you grateful that all your other parts are working fine. Luckily it hasn't hindered my time in the studio. So many silver linings.